Historic England have conceded the engines in the pavilion at Browns Golf Course could not have been installed to power the WWII PLUTO pumps, which is contrary to the basis of their Grade II listing. It has also been shown they concealed this evidence in their report rejecting a de-list application. Further accusations of a planned deception have emerged during an ongoing review of the listing being conducted by the Department of Culture, Media and Sport (DCMS), to whom HE report. The original Grade II listing claimed the pavilion plant was a wartime installation to provide a backup for the mains powered PLUTO pumps. This assumption arose through failure to understand PLUTO pump technology. It was technically impossible for the modest pavilion plant to match the huge power demand of the motors driving the pumps, supplied by a dedicated power line running directly from the Island's power station at East Cowes. HE's interpretation of the PLUTO project was ill informed and suffered from a lack of research. The original idea of a connection between the pavilion and the PLUTO pumps seems to have arisen merely because they were in the same vicinity. No documented evidence was ever provided to support the claim. It is a mystery why HE never considered the obvious probability that the plant was installed by Browns to power their various catering facilities, particularly as the facilities are indicated on the pavilion's switchboard. It was self-evident the owners originally had no option but to generate their own power supply at such an isolated spot. It seems there was no research at all into the development of Browns' operations. It would have probably only taken a few local enquiries to reveal the pavilion plant was still powering these facilities within living memory. The Grade II listing was established in 2006. A challenge to the listing arose in 2017 when a local researcher accessed PLUTO records at The National Archive and realised official accounts disproved the claims. While the case for the listing was purely speculative, evidence to the contrary came from primary sourced documents, and it was these that formed the basis for a de-list application. The de-list application presented HE with a problem. Local enthusiasts had naturally taken the Grade II listing at face value and spent years successfully promoting the site. A renovation of the pavilion had attracting a lottery grant, council support, crowd funding and extensive media coverage. Some local historians had supported the listing with their own imaginative suppositions. HE realised that admitting the listing was groundless would cause considerable embarrassment to themselves and everybody involved. Reputations were at stake. Their solution to the problem was to reject the de-list application, but they could only do so by concealing its evidence. Accordingly, they issued a consultation document that made no reference whatsoever to de-list evidence and merely reiterated the original case for listing. In their final report, they referred to just one piece of de-list evidence but edited it to distort its meaning. It is difficult to see the process as anything other than a planned deception, apparently in collaboration with some local supporters. The DCMS review has forced HE to finally address the de-list evidence. They are attempting to save face and retain the listing by trying to arrive at a pavilion PLUTO connection they can use as an alternative to powering the pumps, while now having to accept the pavilion was already powering Browns club house cafe and ice cream factory. Their solution is to claim the plant was updated rather than installed and was powering PLUTO machinery of which there is no record. The review data was collated by DCMS weeks ago but the delay in completion suggests they are in some difficultly in deciding how to deal with the matter, although DCMS deny this. Reviewing the listing is one thing but accusing a partner body of an organised deception might be something they would not want to dwell on, particularly as it could lead to an inquiry as to who was responsible and at what level it was sanctioned. DCMS appear to have avoided accessing the correspondence which identifies who knew what, so it may be they are looking to confine themselves to generalities. An unfortunate effect of these events is that local supporters have treated evidence of Browns development of the pavilion as something to be avoided, rather than seeing it as an interesting piece of Sandown history in its own right. The plant powered Browns club house cafe, ice cream factory and canoe lake cafe from the early 1930s right through to the late 1960s. It remains a unique piece of local electrical and mechanical engineering. It doesn't need wartime mythology to justify its preservation. After a project lasting over three months, excavations of the 19th century cement works came to an end with the resultant work being on view to the public. The excavations had been carried out by over 50 volunteers, and it was volunteers who explained to hundreds of visitors what the excavations had revealed and the industrial processes involved. We will have to wait for the archaeology report to see the full interpretation of the site but there is no doubt it is a far more complex set of features than had been originally assumed. It provides an insight into the intensive changes in cement technology that were taking place around the 1870s. The revealing of six bottle kilns provides evidence of the earliest kiln technology, while two of these had been subsequently converted to create a chamber kiln, which was an advance in kiln development. Cement manufacturers had the materials to build their own industrial structures with relative ease. This encouraged them to freely experiment with different production methods, not all of which found their way into the historical record. The Dodnor site seems to be an example of such activity. The main kiln seems to have involved more than one phase of construction and its manufacturing method is far from clear. The Gift to Nature team and archaeologist Ruth Waller will doubtless be pleased with a project that appears to have been successful on a number of fronts. It has given volunteers an insight into the world of archaeology and raised the profile of industrial archaeology on the Island. As a community project, it has also brought people closer to the working life of a Victorian community. In this case, a rather gruelling working life. The great mystery uncovered by the excavations concerns the main 'kiln' running east-west. It was assumed this would be a standard chamber kiln, like the one now discovered running north-south. It should have revealed a solid bed running back from its kilns to the chimney. 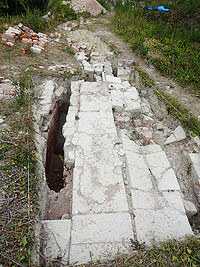 Instead the excavations have revealed deep brick built channels covered by plates, together with other unusual features. It almost certainly represents underfloor heating. If this was a form of chamber kiln, it might be unique to this site. However, it may not be a chamber kiln at all. Further analysis will be required. The Hidden Heroes project was launched in October 2017, with the aim of revealing Island residents who had made a contribution to history but had been largely overlooked by mainstream works. The underlying objective was to raise a general awareness of local history and promote local museums. Those participating in the project regard it as having been a great success. The Isle of Wight Hidden Heroes campaign was one element of a �100K Resilience grant project funded by Arts Council England. The project partners were Carisbrooke Castle Museum, Classic Boat Museum, IW Heritage Service, Dimbola House and Galleries and the Quay Arts Centre. The partnership saw a need to actively engage people with discussions about Island history by trying new methods of marketing and engagement. The partners are members of the IW Museum Forum, a group of Accredited museums who meet twice yearly to share news, training and good practice, and it was they who initiated the grant application. The funding for Hidden Heroes formally ended in April but exhibitions, events and activities still continue on the theme. The most surprising outcome has been the considerable number of hidden heroes that have come to light, often though contributions from the general public and specialist interest groups. The hidden heroes website records over 40 individuals but there may be others still only locally recorded at particular exhibitions. Hidden Heroes exhibitions are still in place at the Museum of Island History, Newport Roman Villa, Classic Boat Museum and Carisbrooke Castle Museum. An important result of the project was the degree to which it brought local history to the attention of Islanders and generated visits to local museums. The exhibition at the Quay Arts had 5,021 visitors. The Travelling Museum visited 10 Island locations, providing over 800 individual tours. Hidden Heroes displays were taken to two Dinosaur Isle open days which had over 4,400 visitors. Workshops were taken into local schools, reaching 270 students who provided material for a small book, freely available on the Hidden Heroes website. Nine talks were given at the Quay Arts Centre and Richard Smout also provided other talks, including balloon debates to Ventnor Fringe and the Carisbrooke Wool Festival.